Paris Saint-Germain would have won the league title yet again by claiming victory on the ground of their nearest rival on the table, Lille LOSC, who once had former Super Eagles great, Vincent Enyeama, as their first-choice goalkeeper. The top-of-the-table clash at the Stade Pierre Mauroy started excitingly with a Thomas Meunier own goal in the seventh minute being cancelled out by Juan Bernat in the 11th minute after good work from Kylian Mbappe to set up the equaliser. 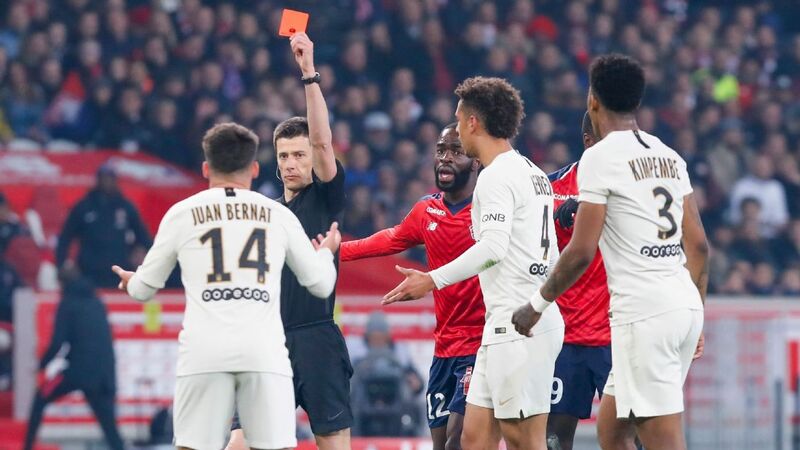 But that’s as good as it got for PSG who fell like a pack of cards in the second half after Bernat was given his marching orders after 36 minutes for a last-man tackle on a Lille player. Nicolas Pepe, previously linked with Arsenal, scored one and provided two more as Lille ran rampant in the second half and keep PSG from wrapping up the league title for one more weekend. Yes, PSG may have lifted the league title in five of the last six seasons and are still bound to get a sixth title in seven years. But on the evidence of this display from Lille, as well as Strasbourg’s battling display last weekend, football fans may want to rethink dismissing the French top flight as a ‘farmer’s league’. PSG crave great success more than anything and having obscenely dominated the domestic scene, the club has sought to emulate their status in France onto Europe, but coach after coach has failed in that project. And Thomas Tuchel appears the latest who will toe that unfortunate line. The former Borussia Dortmund boss was brought in after Unai Emery’s contract was cancelled with a year to go. And though the German has dominated the domestic scene like most of his predecessors, bar the surprise loss in one of the Cup competitions, his failure in Europe and suspect displays in Ligue 1 will make his job a win or bust situation next season – if the PSG hierarchy not known for its patience do not ship him out this summer even. Mbappe may be the league’s top scorer, but the 20-year-old wonderkid plays on another level when on the field with Neymar and Edinson Cavani. However, both have been on the sidelines for months recovering from injury and leaving Mbappe with a heavy burden on his young shoulders. Lifting PSG through at Lille proved a task too much for him. Choupo-Moting owes PSG big time! PSG should be champions already, but Eric Maxim Choupo-Moting somehow managed to keep Christoph Nkunku’s goal-bound effort from going over the line during last weekend’s 2-2 draw at home to Strasbourg. We’re not exactly sure what Eric Maxim Choupo-Moting was doing here The @PSG_English man denied his own teammate and left the ball sitting on the goal line. Had he allowed that to go in, PSG would be celebrating the league title rather than be brooding over a heavy loss at one of their top rivals in France. The club have good players, but Dani Alves is past the level PSG aim to be playing, while the dependability of Marquinhos has been greatly missed and age is beginning to tell on Thiago Silva who was once regarded as arguably the best defender in the world. There’s also Thilo Kehrer who can play multiple positions but ends up being a jack of all trades and master of none, Layvin Kurzawa has not been his old self after recovering from a long injury lay off, while Meunier has also been hot and cold since returning from injury. PSG’s next chance to wrap up the league title comes on Wednesday at FC Nantes. Failure to win that match and every other team left for PSG to play in the league season would be relishing having a go at the Parisians. Will PSG succeed in getting their hands on the league title or is there another shock result awaiting them?